How does AirBerth enhance your Fishing lifestyle? 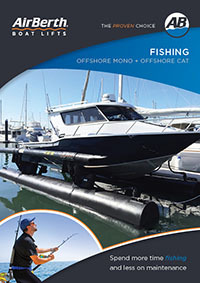 I purchased the AirBerth before I took delivery of my new boat – a 6.5 metre Quintrex with 225HP Yamaha. Your team delivered the AirBerth to my home and installed it in early December and for a couple of weeks it looked rather out-of-place attached my pontoon and just floating aimlessly in the water with no boat cradled in its arms. Then the boat arrived on the Wednesday before Christmas and Alex jumped in his car and drove to the Sunshine Coast first thing Thursday morning to customise the installation to suit my boat. I’m in the customer service business and the level of service from AirBerth is a benchmark I hope all my team can achieve. I looked at all the different options available on the market to ensure my boat would be safe, the system was easy to operate (both launching and retrieving) and as fool-proof as possible (because I’m hopeless with technology). I’m so glad I chose the AirBerth. Since Christmas the south-easterly winds have been blowing between 25 to 40 knots and the last week has been hell on everyone’s boats and equipment, especially those like me that face South/South-East. However, my boat sits high out of the water; safe and sound.I could go on and on about how delighted I am, but I’m off to launch my boat from my hassle-free AirBerth and go fishing. Thanks again Alex to you and your team for your service, advice and assistance. May 2016 bring continued prosperity and success. And to anyone out there looking at installing a berthing system to keep your boat safely out of the water – then stop guessing and procrastinating and get yourself an AirBerth; you’ll love it and the peace-of-mind it brings you.